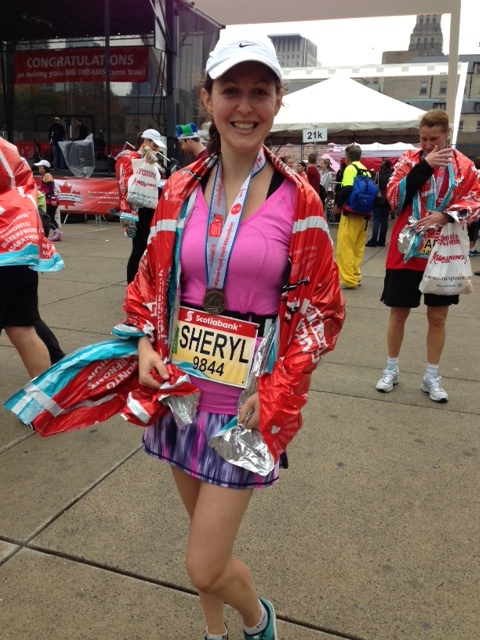 Back in October, I participated in my second half marathon, the Scotiabank Toronto Waterfront Half Marathon. Why has it taken me three months to write this race recap? I don’t have a good excuse. It has been a combination of procrastination, and wanting to write the “perfect” race recap. I’m letting perfection go, and here it is. Better late than never. My training leading up to the race felt strong. I found it a lot easier to train for this race than my first half marathon that I ran in May 2012. Each long run for my May race was really hard. It wiped me out for the rest of the day. I was sore for days after. This time, the long runs were no big deal. I knew how to properly prepare for them. I knew how to tackle them, and I knew how to recover. I was feeling fairly confident in the weeks leading up to the race. But then the week before, as I checked the weather forecast, my confidence started to wane. They were predicting rain, and a lot of it for race day. I had run in the rain before, but never a long run. I started to psych myself out. I didn’t know what to wear. I was worried about being freezing cold and wet and soggy and chafed all over. I even thought about dropping out of the race. Then I remembered all of my friends and family who had generously sponsored me and helped me raise funds for La Leche League. There was no way I was going to drop out! Here’s a post explaining how I tackled the rain. Morning of the race it was 10 degrees Celcius and pouring rain. I was not pleased! I sucked it up and headed down to the start line. It was quite well organized with properly marked starting corrals, and lots of available porta-potties. I wore a Lululemon Pacesetter run skirt and a Lululemon Swiftly v-neck short sleeve T-shirt. I covered myself in a makeshift raincoat made out of a garbage bag and brought along a throwaway umbrella. I wanted to stay as dry as possible before the race. In spite of my wish for dryness, my shoes and socks got soaked. But, my clothes and hair stayed dry before the race started, and this was quite nice. I saw lots of soaked runners at the start line, and they looked pretty cold and miserable. When the race started at 8:30 am, the pouring rain had slowed down to a very light drizzle. This made me very happy. My feet stayed wet for the whole race (it was hard to avoid puddles) but my clothes never got wet. The race started at University and Dundas. The route took us through many nice areas in Toronto. I ran past the hospital where I gave birth to both of my kids. I ran past the dorms I lived in at the University of Toronto when I did my undergrad. I ran past the corner of King and Bay, past a tall office tower in which I worked before I had kids. It felt awesome knowing that I am currently in the best shape of my life, better than I was as a student in my 20s, and better than I was before I had two kids. Overall, I am quite pleased with my time. I kept my pace steady during most of the race and I love that my last mile was my fastest. During the race, I was trying to psych myself up and kept repeating positive thoughts to myself, such as: “I trained perfectly for this race. I am wearing the ideal outfit for these conditions. I love running. This is a great day to run! No one said this would be easy. It is a challenge and that is why I love it.” Perhaps these thoughts sound cheesy to you. They are a bit cheesy, but thinking positive thoughts helped me make it through the race. I believe that distance running is 90% mental, and 10% physical. You obviously have to put in the time training your body, but you also have to really use your mind to make it through a race, and you need to use your mind to push your body through the pain. OK, back to the race. I didn’t want to start out too fast. I felt great through the first 6 miles. At around mile 6, my legs got a bit tired and my muscles started to ache a bit. Once I got to mile 10, I knew I only had 3 miles left (5k). My legs were hurting at this point, but I sped up a bit, knowing I was near the end. The crowd was quite large during the last mile, and it felt great to hear all the cheering. The last 500m or so were slightly up hill. That was not fun. But I pushed myself right until the finish line. I really wanted to finish under 2:30. I crossed the finish line and felt amazing! I also felt freezing and was quite thankful for the mylar blankets they were giving out. The area after the finish line was quite crowded. It probably took a good 15 minutes to walk through the area where I collected my medal and some food before I could get to the post run party, which was held in Mel Lastman Square at City Hall. The area where they designated for us to walk was far too narrow for the amount of people. This was probably my only complaint about the logistics of the race. My parents and brother were there to greet me at the party and snap a few pics. My husband and kids stayed home because of the inclement weather. I missed them, but it was nice to have some time to recover and enjoy the party, rather than chasing around two little ones. My second half marathon was a phenomenal experience. I was amazed how much easier it felt than my first half marathon, and I know that with more training and more miles under my belt, I can easily improve my time. I know that there is a 2:15 half marathon in my future, and maybe even a 2:00. I also know that there is definitely a marathon in my future, but probably not until my kids are a bit older. Since my half, I have kept up my running. I try to run 2-3 times a week (which is not easy in the middle of winter!). I haven’t kept up my distances – I think the farthest I’ve gone has been 7km. I’m OK with that – it has been good for my body to recover from the distances and I’ve enjoyed some cross training, including spinning, cross country skiing and some weight training. I’m planning on taking a break from racing for the next little while. I will stay active and run – not because I’m training for something, but because I truly love running. I love what it does for my body, mind and soul. While races are a lot of fun, every day that I run is a good day. Categories: Exercise, Half marathon, Running | Tags: Exercise, Half Marathon, running clothing | Permalink. Like many other runners, I love bananas. We seem to go through so many in our house! They are an amazing snack before a run, after a run and basically anytime throughout the day! They are also so versatile when mashed and used in baking, and I adore them sliced in a bowl of oatmeal. I find them very easy to digest, and they pack a lot of nutrition into 100 calories, including 3 grams of fibre and 12% of your daily requirement of potassium. I’ve been reading a lot lately about the deliciousness of banana soft serve (which is basically frozen bananas processed in a blender). I was inspired by the Ultimate Vegan Ice Cream over at the (Never) Homemaker blog, and the “Blizzard” recipes over at Angela’s Oh She Glows blog. So, I decided to come up with own version, made from some of my favorite ingredients – bananas, coconut milk, almond butter and chocolate! It is so simple to make – I hope you give it a try! Slice bananas and place in freezer for an hour until frozen, or overnight. Place frozen bananas, coconut milk, almond butter and ice cubes in food processor or blender (I used a Vitamix, of course). Blend until smooth. Top with chocolate. ENJOY! This recipe makes 2 large servings. You will be so surprised how creamy the bananas get in the blender. You won’t believe that this ice cream is dairy free! I used greenish bananas, and the ice cream did not have a strong banana flavour. 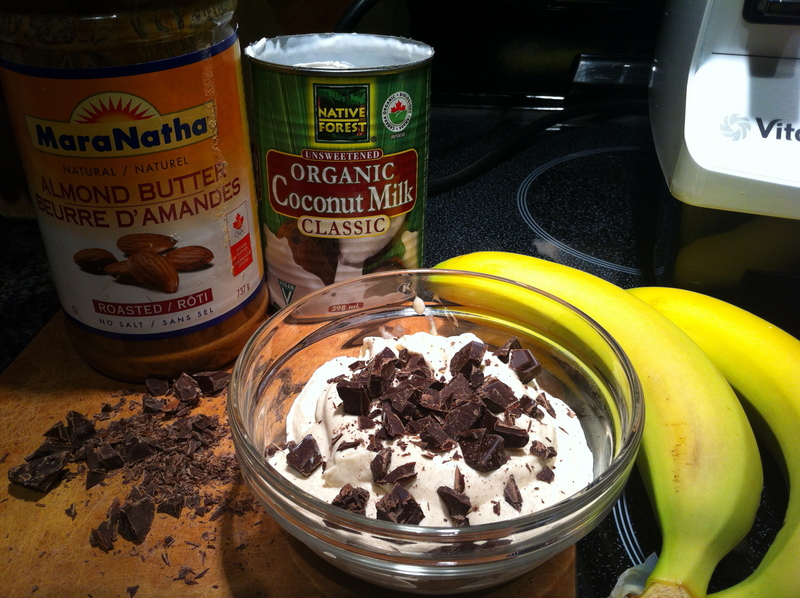 I think I like this recipe even more than my previous coconut milk ice cream recipe! It is a bit lighter, more refreshing, and not quite as rich. Categories: Cooking, Gluten free, Vegan | Tags: bananas, coconut milk, running clothing, vegan ice cream, vitamix | Permalink. Week one of half marathon training is complete! It felt great getting back into a training program. I’ve kept up my running since my 5k back in September, but having a race to train for gives me a motivational boost on lazy days to actually get out there and run. I honestly never thought I’d like running in the winter. I started running in July and just assumed that becoming a sweaty mess with a beet red face was just part of being a runner. In the summer I’d always run as soon as I woke up to avoid the hot temperatures and the blazing sun. As the temperatures got cooler over the fall, I bought some warmer running clothing and embraced the lower temperatures. I realized that in the cold weather it is easier to go faster and if I get hot I can just take off a layer or unzip a zipper. I can run at any time of the day and not worry about the sun or overheating. 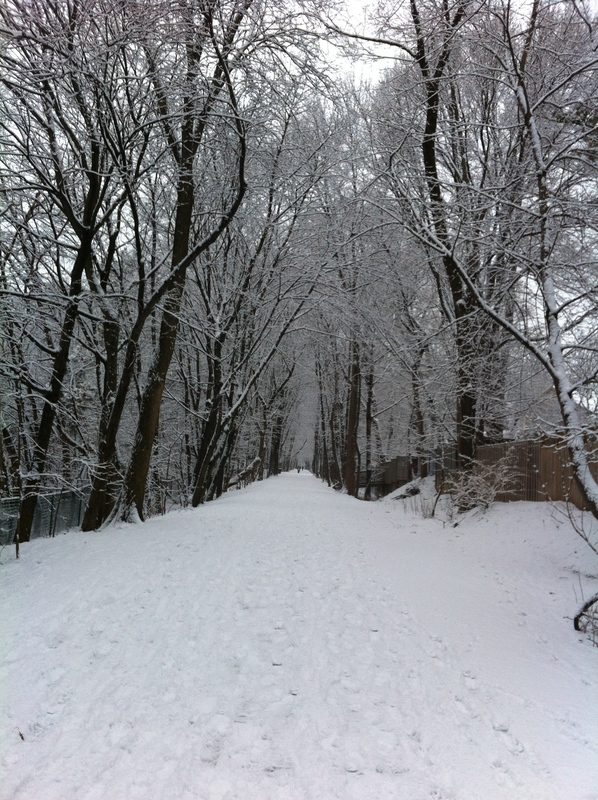 We’ve had a pretty mild winter here in Toronto, so that probably is part of the reason why I love winter running so much. Most days there is barely any snow on the ground so the roads have been clear. On the occassional times when there has been some snow, I just slow down. My goal on snowy days is to just get out there and not worry at all about my pace. The most important thing is to not fall and get injured! The trees were so pretty! I loved hearing the crunch of the snow under my feet. I’m usually cold right when I go out the door and for the first km or so, but then I warm up and it feels really good to be outside in the fresh air. Something interesting I’ve noticed about running – runners are friendly! When I’m running in the cemetery or trail near our house, 9 times out of 10 other runners say hi or good morning when we pass by each other. 9 times out of 10 walkers do NOT say hi. Why is that? Categories: Exercise, Running | Tags: cold weather, Half Marathon, running clothing | Permalink.